Yankee Doodles Cousins is for Baby to Pre-K. Yankee Doodles Cousins was written by Anne Malcolmson. Yankee Doodles Cousins was published by Houghton Mifflin Company. 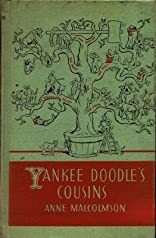 Subjects of Yankee Doodles Cousins include Automobile travel, Children: Babies & Toddlers, General, Juvenile Nonfiction, National parks and reserves, Roads, Roadside improvement, and United States.